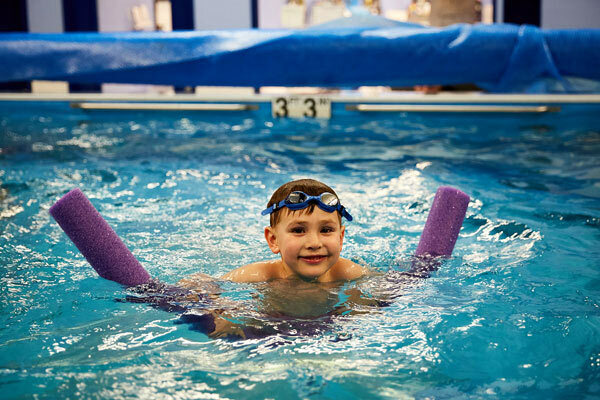 Eneko, 6, began taking swim lessons when he was 6 months old. Swimming is now a favorite family pastime. Like many adults, Haydee Lopez of Chicago never learned to swim as a child. In fact, swimming was a pastime she never really tried until she was married. So when it came to her son, she knew she wanted him to learn to swim early on. Haydee enrolled Eneko, who is now 6 years old, in our Infant-Toddler Swim Classes when he was 6 months old. These group classes are designed for parents to participate with their children between the ages of six months and 4 years. Parents and children bond and learn together in the water, and parents learn techniques to keep their children safe. At the age of 4, the kids are old enough to advance to preschool-level swim classes, and their parents are no longer in the water with them. Haydee had no idea how Eneko would react to the water or the coaches. She only knew she didn’t want him to go through the first half of his life not knowing how to swim. She was pleasantly surprised when he immediately took to the coach and to the water during their first lesson together .